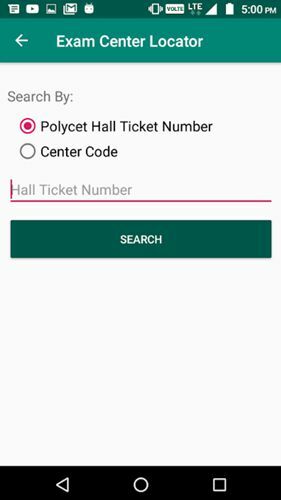 TS SBTET POLYCET Exam Center locator App: State board of technical education and training telangana has released Polycet Exam Center locator Application at google play store and sbtet.telangana.gov.in. 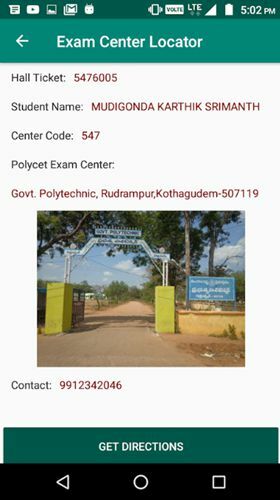 Candidates Can Download TS Polycet Exam Center locator App and reach the center without faceing any troubles. The State Board of Technical Education and Training, Telangana, Hyderabad will conduct “Polytechnic Common Entrance Test (POLYCET)” for the candidates seeking admission in to all Diploma Courses in Engineering /Non Engineering/Technology offered at Polytechnics /Institutions (including Aided and Unaided Private Polytechnics /Institutions running as 2nd shift in Private Engineering Colleges) in Telangana State for the academic year 2019-20. TS SBTET going to be held Polycet examination on 16-04-2019 (Tuesday) from 11.00 AM to 01.00 PM. The Board was created under the authority of Government of Telangana as an adjunct office of the Department of Technical Education. While the Technical Education Department concentrates more on the administration and developmental aspects. The examination (POLYCET) will be of 2 hours duration consisting of only one paper as per the syllabus in the subjects of Mathematics, Physics and Chemistry of X Class (S.S.C.) Examination held in March/April-2019 as prescribed by the Board of Secondary Education, Telangana State. i) 60 Questions in Mathematics for 60 Marks. iii) 30 Questions in Chemistry for 30 Marks.